This version of the Aspire E 15 packs in a Intel Core processor and a full HD screen for $350—and it's easily upgraded, too. 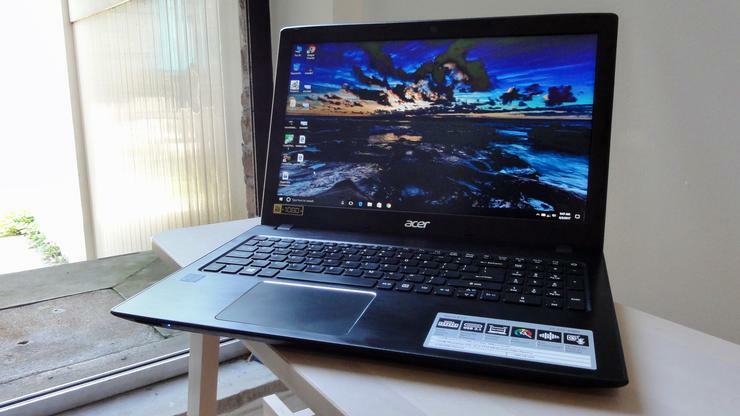 Anyone who’s researched sub-$500 laptops in recent months will know the Acer Aspire E 15. For a while now, the E5-575-33BM model has maintained its status as a best-selling laptop on Amazon. In fact, it’s often been the top seller. Looking at specs, it’s easy to see why this cheaper version of the Aspire E 15 is so popular. For just $350, you get a Core i3 processor, a 15.6-inch display with a resolution of 1920x1080, a 1TB storage drive, and Windows 10. Typically 15-inch laptops in the $300 range only offer 1366x768 screens. Given just how much Acer’s crammed into this incredibly affordable laptop, we were curious to see how it would perform during use. So we decided to fire one up in our lab. Measuring 10.2 x 15.02 x 1.19 inches, the 5.06-pound Aspire E 15 won’t ever be mistaken for an ultraportable. Most people will notice the heft of this laptop in their bag—and when you add the power brick, the total weight rises to 5.6 pounds. 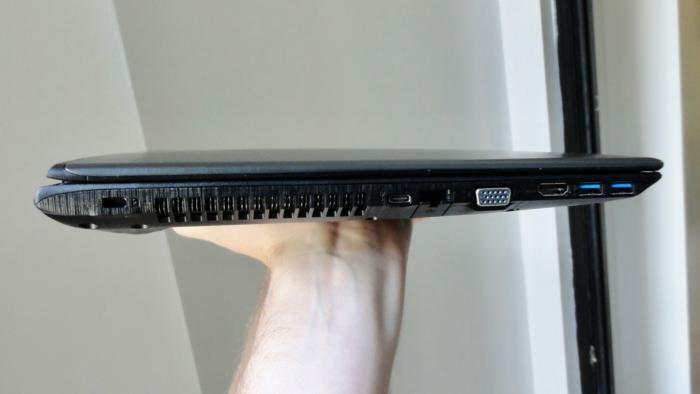 That said, big and hefty is the name of the sub-$500 laptop game, particularly when it involves an Intel Core processor. If you want something thinner and lighter with an Intel Core i3 CPU (or better), expect to double or even triple your budget. The Acer Aspire E 15 cuts a dapper profile, thanks to its tapered shell and brushed finish. Despite its bulk, the Aspire E 15 manages to cut a dapper profile, thanks to its tapered shell and handsome brushed finish. The shell itself feels solid and tough, while the display barely wobbles while picking the E 15 up or putting it down. The only flimsy component I noticed was the Aspire’s DVD tray (yes, it has one! ), which you could probably snap off with a minimum of effort. Inside is a 2.4GHz dual-core Intel Core i3-7100U processor, 4GB of DDR4/2133 RAM and a 1TB hard disk drive. Though the 7100U is the lowest-end chip in the Intel Core family, it’s a part of the most current Kaby Lake (7th-generation) processors—meaning it provides better battery life, among other performance improvements. Its integrated graphics core is the Intel HD Graphics 620, which is more than fine for typical basic activities like movie watching and web browsing. If you want more power on both the CPU and GPU fronts, you’ll need to upgrade to the Aspire E 15 E5-575G-57D4, which features a Core i5-7200U processor and an Nvidia 940MX discrete GPU. That $580 machine will support some gaming and better handle CPU-intensive tasks. 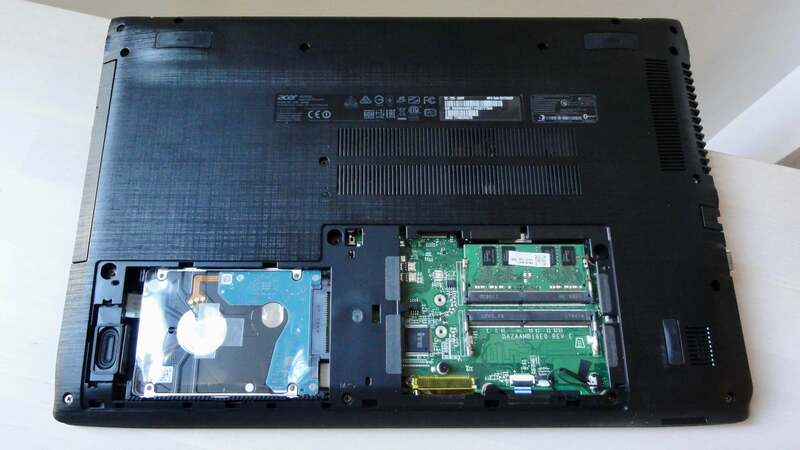 Worthwhile to note: You can upgrade both the RAM (up to 32GB) and the storage drive quite easily, thanks to a three-screw access panel on the bottom of the Aspire E 15’s shell. The Acer Aspire E 15’s roomy LED-backlit display is surprisingly good, given the laptop’s budget price point. Boasting a resolution of 1920x1080, the 15.6-inch matte panel looked razor-sharp when it came to such day-to-day office chores as composing Google Docs and tinkering with spreadsheets. Our 4K test video (downscaled for the display’s 1080p resolution, of course) also dazzled with its detail. However, the Aspire’s 16:9 display is a tad on the dim side: When cranked up to maximum brightness, it registers only at 216.5 nits, or candelas. 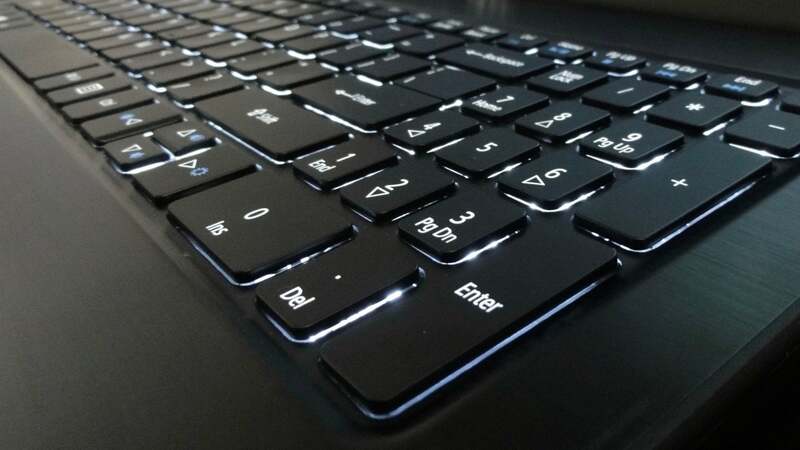 We’re not surprised by the low maximum brightness, as that’s fairly common for budget laptops. For an indoor setting, however, we typically like an output of 250 nits—and you may have trouble seeing what’s on the screen when outdoors. Viewing angles are iffy, but not surprisingly so. Looking at the screen from either side is the better experience: It begins to dim beyond 20 degrees or so. Tilt the display up or down, though, and the screen almost instantly looked blown out (looking from above) or inverse (looking from below). As for the 720p webcam that sits just above the screen, it's serviceable for business video chat. Colors look vivid, but the image is distractingly blotchy and noisy. With a dedicated (but slightly squished) numeric keypad, dedicated functions keys, and even dedicated Home, Page Up, Page Down, and End keys, the Acer Aspire E 15 gets high marks when it comes to the sheer number of keys on its backlit keyboard. The keys themselves are a tad squishy, as one would expect from a budget laptop, but otherwise fairly clicky and comfortable. A dedicated numeric keypad is a highlight of the Acer Aspire E 15’s comfortable keyboard. The E 15’s roomy trackpad felt relatively accurate to my fingertips, and it was perfectly adequate for navigating menus in Chrome as well as pinpointing spreadsheet cells. I wish clicking took a bit less effort, but I appreciated how the trackpad reliably ignored unintended palm swipes. The dual stereo speakers, which are embedded in the front edge of the Aspire E 15’s case, are loud but a bit muddy. You can crank the speakers all the way up without any distortion, but the overall sound quality is what you'd expect from a $350 laptop: tinny, lacking bass, and not much in the way of clear detail. The Acer Aspire E 15 comes equipped with a relatively generous selection of ports. On the left side of the laptop, you’ll find a pair of USB 3.0, a USB 3.1 Gen 1 Type-C, VGA video, HDMI, and gigabit ethernet. On the right side is a single USB 2.0 port near the 8X speed DVD burner and a 3.5mm audio jack, while a SD card reader sits on the front edge, next to the power light. The Acer Aspire E 15 serves up a generous selection of ports that includes VGA, HDMI, gigabit ethernet, and USB 3.0. While a faster USB-C port or a mini-DisplayPort would have been nice, it’s hard to complain given the E 15’s $350 price point. If you weren’t expecting much out of a $350 Windows 10 laptop, prepare to be surprised. Sure, the Aspire E 15 chugged a bit when I had too many programs running at once or after a few days without restarting, but for the most part, it surfed the web and ran Office apps with ease. The numbers back that as well. When we fired up PCMark 8’s Work Conventional benchmark, which simulates everyday activities like web browsing, video chat, and document editing, the Aspire E 15 posted a score of 2,500. In our experience, a laptop would have to sag below 2,000 before you’d notice a dip in overall productivity performance. If things do start to feel slow over time, we’d first eye the hard drive inside the E 15 as the issue. To gauge the Aspire E 15’s performance during short bursts of intense activity, we turned to Maxon’s Cinebench R15 test. It’s a quick benchmark that puts all the stress on the CPU while rendering a 3D scene. Most laptops finish the task in just a few minutes, so it’s a good approximation for seeing how a system will handle brief moments of high processor utilization. Overall, the Acer Aspire E 15 will feel average in speed when the CPU is hit hard in little bursts. Faster processors in the same generation (like the Core i7-7500U in a much more expensive HP laptop) easily beat its performance, but the Aspire E 15’s Core i3-7100U still manages to hang with an older Core i5 processor. And as you can see, while the differences in processor power don’t matter as much during basic tasks (as shown in the PCMark 8 results), it does once you start pushing the CPU. That divide only widens as you push the CPU even harder. Our encoding test—a real-world benchmark that involves converting a 30GB MKV file into a much-smaller MP4 on Handbrake’s Android Tablet preset—is essentially a torture test for laptops with dual-core mobile CPUs. We use the results to see if performance suddenly drops off a cliff while a system endures 100-percent CPU utilization over an extended period. 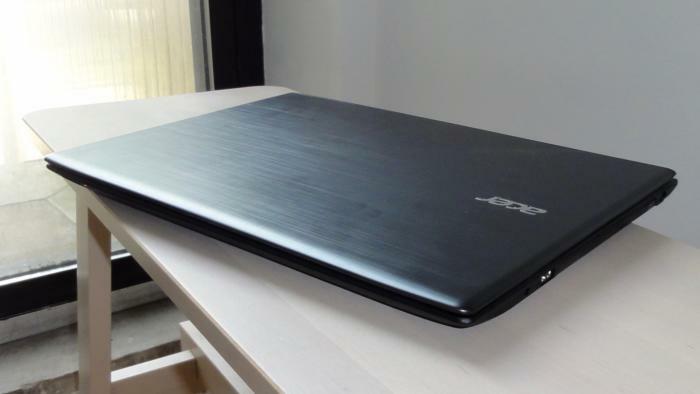 Thanks to its current-generation processor, the Acer Aspire E 15 holds up pretty well. If you’re considering an older budget system with a higher-tier chip (like that older Aspire E 15 in our chart), this particular benchmark is proof that you may still be better off with a newer Core i3 instead of an older Core i5, especially since you’ll get to take advantage of Kaby Lake’s improved media engine and effect on battery life. Speaking of the latter, this Aspire E 15 clocks in with respectable battery life, especially given its price, screen size, and resolution. To test a laptop’s battery performance, we play a 10-minute 4K video over and over in Windows 10’s Movies & TV app until the battery dies. Typically, we do so with the screen brightness between 250 and 260 nits, but because the Acer Aspire E 15 maxes out at 216 nits, we ran this benchmark at its max setting. We also keep the audio volume at 50 percent with earbuds plugged in. The result: an impressive 454 minutes, or just over 7.5 hours. That might not seem as impressive in comparison to the Spectre x360 or the older XPS 13 in our comparison chart, but those particular laptops have smaller 13-inch displays—and, given their prices (nearly three times higher than the Aspire E 15), possibly also more power-efficient displays.